Gold prices edged higher during yesterday's session as US data weakened the Dollar. However, during today's early session, the yellow metal erased all of yesterday's gains after data released showed China’s industrial output grew at the slowest pace in 17 years for the first two months in 2019 denting investors' appetite for riskier assets. Moving ahead, there aren't any major market moving US economical data scheduled for today and hence, the US bond yields/USD price dynamics might continue to play an important role in influencing the commodity's intraday momentum, in addition to any potential Brexit or US-Chinese trade developments. 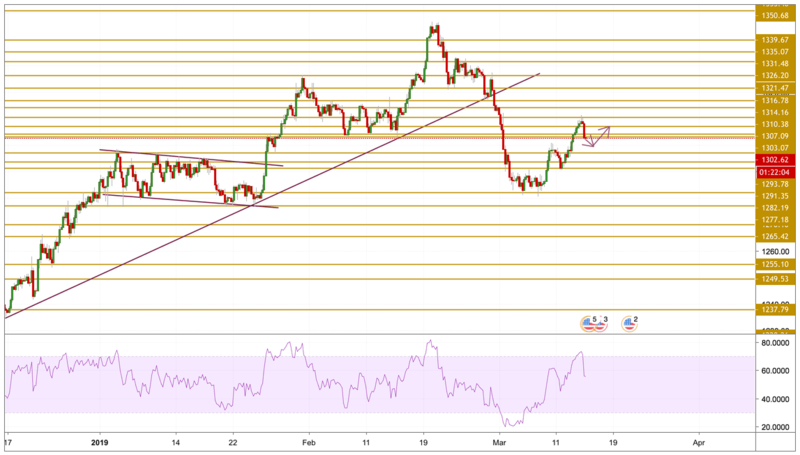 As expected, Gold prices surged to reach the $1310.38 resistance level but could not settle above it and immediately retreated back towards near support levels. The price is currently trading below the $1303.07 level and the momentum seems to be declining in a fast pace after entering the overbought zone. We will be focusing on the retest of the previous highs at the $1300 psychological level.